Moving into a new home or to a new town can be exhilarating, and unfortunately, very stressful. 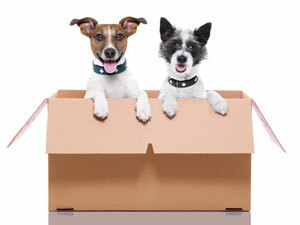 Packing boxes and moving furniture can be hard not only on you, but it can be hard on your pet as well. Strangers in your home and moving equipment can make your pet anxious. Plus, the transition to a new home and environment can be very stressful for your pet. If you are getting ready to move soon, here are a few helpful tips to ensure a stress-free move with your four-legged friend. Find a safe place: When you’re moving furniture, your front door is open a lot, which means your pet can make a “great escape”. Therefore, it’s best to keep your pet in a crate until all the fuss is over. Crates are great for giving your pet a relaxing and safe place to hide and for keeping him or her safe while moving around. Keep meds, supplements and food out of boxes: It’s easy to pack every single thing on the countertops without pausing to think, “Will I need this soon?” When it comes to your pet’s food, supplements or medication, it’s not really efficient to pack it up while you’re in-between places. Have a dedicated area for all of your pet’s daily supplies and maybe write a note on it to ensure you do not pack them. Find a new vet: If you are moving to a new town, start searching for new veterinarians while in transition. Your current veterinarian may even be able to recommend someone in specific areas. Before you go, don’t forget to ask for your pet’s veterinary records. Once you get to your new city, visit your new vet’s office, check it out for cleanliness, and introduce yourself and your pet. Get your new house “pet ready”: Were there any problem areas in your old home that were unsafe for your pet? Are the same problems in your new home? Before your pet gets settled in, check out all the spaces of your new house and make sure everything is pet-friendly. If your pet isn’t accustomed to having stairs, you may want to put a gate at the top of the stairwell to prevent him or her from falling down, especially at night. Change your pet’s tags: Lastly, once you get everything in place and you are in your new area, change your pet’s tags to your new address. This is important in case your pet gets lost. If your pet has a microchip, be sure to contact the provider and change all the information.